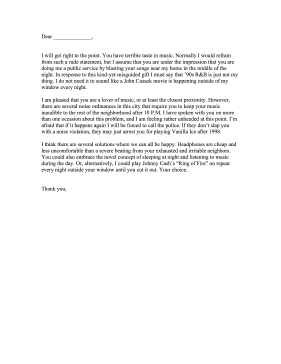 This printable complaint letter is both funny and insistent that neighbors curb their loud music. I will get right to the point. You have terrible taste in music. Normally I would refrain from such a rude statement, but I assume that you are under the impression that you are doing me a public service by blasting your songs near my home in the middle of the night. In response to this kind-yet-misguided gift I must say that '90s R&B is just not my thing. I do not need it to sound like a John Cusack movie is happening outside of my window every night. I am pleased that you are a lover of music, or at least the closest proximity. However, there are several noise ordinances in this city that require you to keep your music inaudible to the rest of the neighborhood after 10 P.M. I have spoken with you on more than one occasion about this problem, and I am feeling rather unheeded at this point. I'm afraid that if it happens again I will be forced to call the police. If they don't slap you with a noise violation, they may just arrest you for playing Vanilla Ice after 1998. I think there are several solutions where we can all be happy. Headphones are cheap and less uncomfortable than a severe beating from your exhausted and irritable neighbors. You could also embrace the novel concept of sleeping at night and listening to music during the day. Or, alternatively, I could play Johnny Cash's "Ring of Fire" on repeat every night outside your window until you cut it out. Your choice.